This Accessible Parking sign can be used to direct drivers to parking spaces reserved for persons with disabilities. This sign to guide people to handicapped parking spaces is available without an arrow, or with right, left, or ahead arrows. 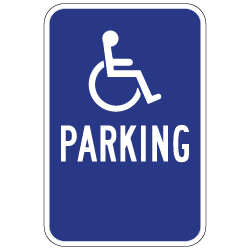 While there is a Federal Handicapped Parking Sign to use for reserving the actual parking space reserved for handicapped drivers, and while many States have their own style of parking sign for use in reserving each parking space for disabled people, this sign is designed to direct handicapped drivers to reserved parking when it is not easily visible from the entrance of a parking lot, parking garage, or other parking area. DOUBLE the working life of your Accessible Parking Guide Signs by adding 3M Protective Overlay Film (POF)! 3M’s high-tech POF protects sign faces against fading caused by the sun and harsh weather—and makes graffiti and sticker defacement damage easy to clear away without harsh abrasives.